The most important industry insiders. They organize major exhibitions and art fairs, headed by leading publications on design or develop it personally. Things from the exhibition Items: Is Fashion Modern ?, opened at MoMA until 28 January, curator Paola Antonelli combines with everything she sees in museums around the world, is on YouTube and social events and has time to take pictures in the cycle of New York life. All that impressive Mette Yorty Haye - from Rachel Whiteread sculpture to her father's green calculator from the 90s - can be seen on instagram. There you will learn what things HAY catch in design stores around the world, and find new ideas for travel. Creative director HAY dissecting continents far and wide and manages to run on all of the key exhibitions. The queen of flowers, a citizen of the world - as soon as any call of the designer. She was born in a family of Iranian and Egyptian women, she managed to stay in the United States, Italy and France, to work with Ladurée, Vitra and many fashion houses - from Valentino to Louis Vuitton. In the last collection, Objets Nomades, India entered the 'western version of the Eastern table "- and this is just one example of how design combines the world. "There is everything on Madava's instagram: all new projects, scenes from the privacy and interesting design finds. Did you know that Maarten Baas celebrated a decade of his "clay" chairs casting the same model in bronze? Did you see a hanger and shoe mirror, he developed for Berluti, and very "plump" vase of the last Dutch Design Week? Even so, there are lots of other things that do not fit on the pages of magazines and online publications. Pastel flower racks, glossy blue couches, dozens of custom interiors, designed in Moscow and New York. This fall, about Nureyev and his brand with Russian roots told The New York Times, and now it is the first time participating in the fair Design Miami (6-10 December, Miami). For direct interventions from there and New York to follow the everyday life of Nureyev equally interesting. Minimalism and white walls - not about him. If the French XIX century dressers, colorful, romantic motives in the interior of the palace and richly-shape rooms - this is what you like, Kirill Istomin will be an important character in instagram feed. A graduate of Parsons School of Design, of which the AD, and Elle Decoration named the best Russian designer, working both at home and in the United States and Europe. The Marcus Fers does in his spare time from work, where he rests and he meets - it can not be seen on the website he founded, one of the most influential in the industry or in written Fersom books about design. Fans who read the site Dezeen daily recommended twice. Anna Muravina, designer, decorator, author of "Recipes happy interior"
It is worth to take a closer look at the interior of Anna Muravina's authorship - her collection Anna repeatedly shown at the Paris Maison & Objet. 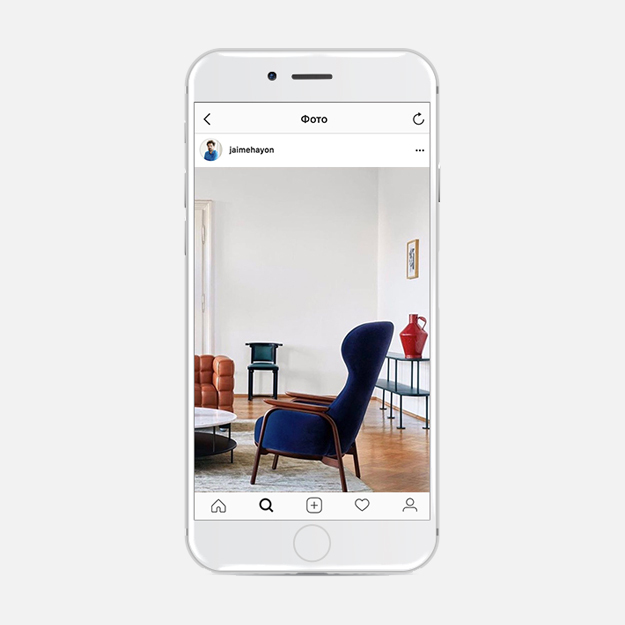 They are also present at her instagram - along with photos of finished interiors and personal images that accompanies Muravina advice on and voluminous comments. Hayon is inspired by architecture of Tadao Ando, sculptures and paintings KAWS Ellsworth Kelly, and even Seoul, Valencia, Vancouver, Doha and many other things. If the world on a string, then only the best: those who love the work of Hayon trusts his taste. A new chapter of the New York Chamber of the fair, and in the past the chief editor artnet News does not seem instagram-public persona. She has less than a thousand followers, but there are rare content: Jovanovic opened a lot more doors than those who looks at the world of design by. And, of course, it's a chance to peep that will be shown at the next Collective Design Fair in March.